Darkwing Duck is an American animated action-adventure television series produced by The Walt Disney Company that ran from 1991–1995 on both the syndicated programming block The Disney Afternoon and Saturday mornings on ABC. 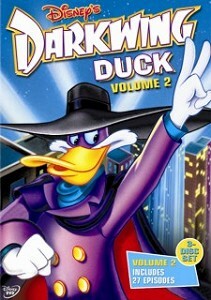 It featured the eponymous anthropomorphic duck superhero whose alter ego is mild-mannered single quacker Drake Mallard. It is the only direct spin-off of DuckTales. 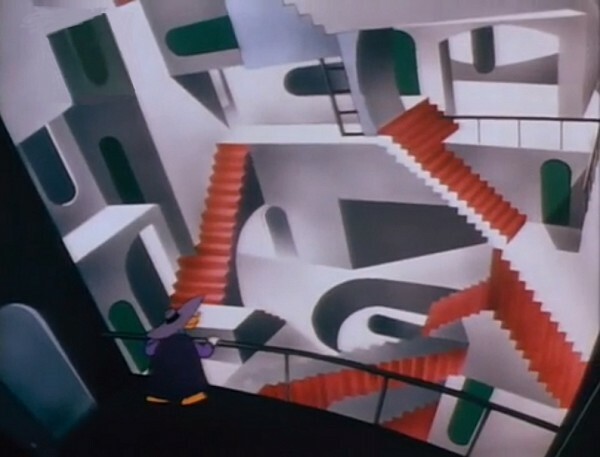 In season 2 episode 4 "Fungus Amongus" Darkwing Duck finds himself in a room, which reminds us "Relativity" of M.C. Escher. Screenshot from the episode is presented below.